Döner kebabı or 'turning kebab,' is a popular Turksih street food. Shavings of 'turning kebab' are usually eaten plain over rice or wrapped in a soft tortilla made from wheat flour, called 'dürüm'. 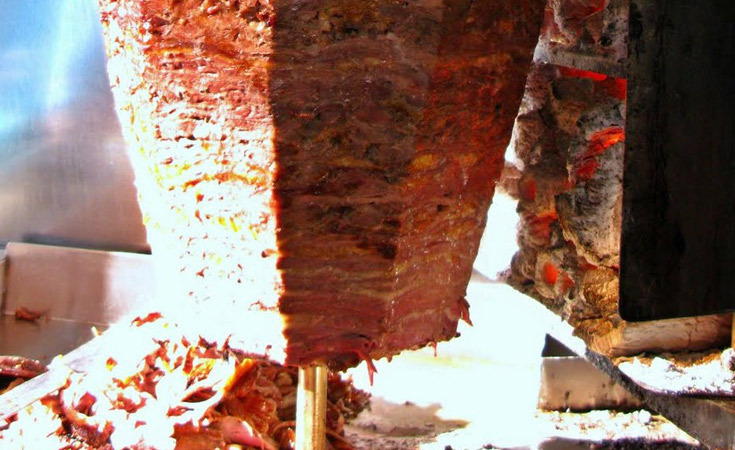 Döner kebabı or ‘turning kebab,’ is a popular Turkish street food. Shavings of ‘kebab’ are usually eaten plain over rice or wrapped in a soft tortilla made from wheat flour, called ‘dürüm’. This kebab originated not in the deep southeast, but in Bursa, a city just south of Istanbul and the first capital of the Ottoman Empire. Word on the street has it that originally, ‘döner kebab’ was hung horizontally and cooked over coals similar to the way it’s done further East. One day, İskender Efendi, who lived in Bursa sometime back in the 1800s, decided to invent a special grill to roast meats vertically. This new invention allowed the meat to be rotated and shaved off simultaneously. Thus, modern ‘döner kebab’ was born.